Josh Eichorn: in the desert he can remember his name ‘cause there ain’t no one for to give him no pain. Malcolm Dragon questions just what his father is doing as he eats parts of Dark Dragon’s brain in front of him. Emperor Kurr declares that killing Dark Dragon was the only way to stop his rampage and consuming his brain is the only method to prevent any kind of regeneration. Malcolm is terrified of his father who has been acting differently ever since his resurrection. Kurr points out that he had much of his brain eaten by Virus so there was always going to be some difference in his personality. When he comments that Dragon is going to get into trouble over his actions, Malcolm is struck by his father. He flies through the skyline until he impacts into a building before bouncing back down to the street floor below. Malcolm is gripped with fear and quickly opens up an entrance to the sewer before fleeing underground. He comes to the realization that Dragon is truly gone and been replaced by something evil. As someone approaches, Malcolm worries that it is Dragon but is relieved when Flash Mercury reveals himself and offers to help the youngster straighten everything out. Angel helps remove piles of debris so that Daredevil can pull out anyone they come across. There are precious few survivors in the rubble and it is mostly corpses and body parts that they are uncovering. The duo are then joined by a number of Vicious Circle members, all of whom have been injected with Dragon’s blood and been transformed. They discover that Dragon was in a fight that caused all of this destruction and the heroes worry over his health. R. Richard Richards appears on television where he notes how he finally feels vindicated over his hatred of Dragon. He declares that they cannot depend on Dragon to protect them from evil any longer, especially now that he has helped cause the deaths of thousands of innocents. Richards then demands that Dragon be hunted down and killed. This broadcast is seen by Vanguard who hears a noise elsewhere in his spaceship and investigates. He discovers Emperor Kurr interacting with his computer systems but the villain states that he has finished what he was doing. Vanguard’s personal teleportation unit is stolen from him and Kurr escapes back to Earth. 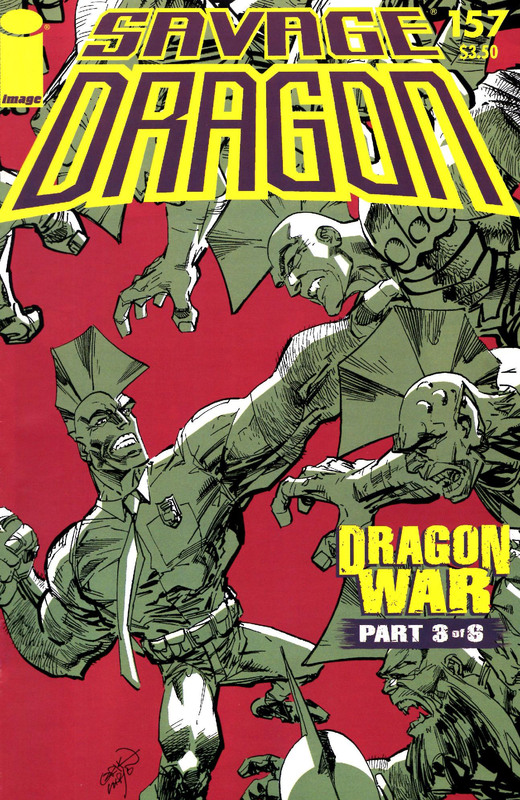 In the Chicago Police Department’s precinct, the officers discuss the fact that Dragon has killed someone and then eaten their brains. They do not feel comfortable working with him any longer but Captain Stewart assures them that Dragon is off of the force and is now wanted for murder. He enters into his office to find OverLord waiting for him. The arch-villain announces that the Vicious Circle is now simply the Circle and is dedicated to securing mutant rights. Over at Stronghold Penitentiary, the guards are put on notice when one of the inmates begins breaking out of their cell. Mutation bursts out through the walls of her cell, confident that nobody can restrain her and she will soon reclaim her freedom. Galian attempts to commit suicide by burning out his body with the power lens but it vanishes from his hands. He notes that James Peterson will not be rid of his newfound responsibility so easily and that the lens has gone back to him. Galian is disappointed not to have died as he cannot bear the thought of having to live in his new time-ravaged body. James races towards the outer walls with Valerie Brisbane but she announces that she has no intention of leaving the tower. She is now part of Powerhouse and feels like she is home and informs James that he is now home too as the power lens returns to his forehead. Charlie Hendrix and James talk about how Ethrian remains a separate entity and how James does not control his dual identity. Charlie suddenly collapses in pain as his body is transformed by previously hidden nanotechnology.